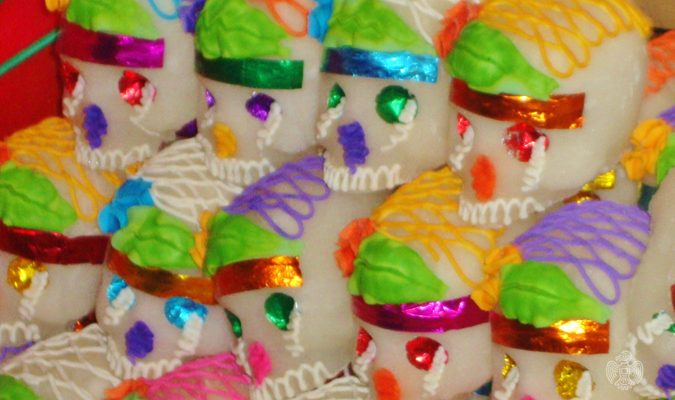 Day of the Dead, or Dia de los Muertos, is an often misunderstood holiday celebrated in Mexico. 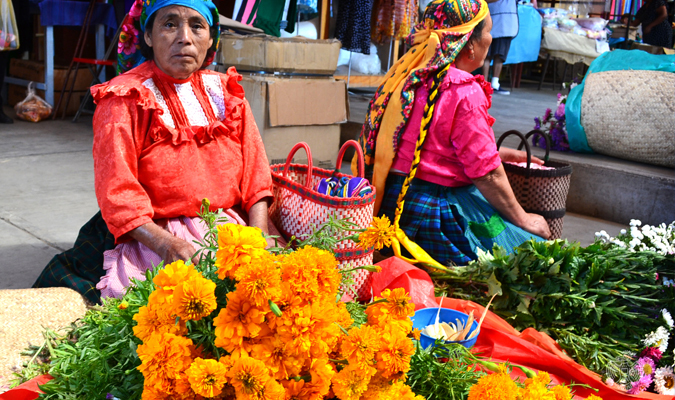 It originated from a centuries old Aztec festival in honor of Mictecacihuatl, a goddess known as the Lady of the Dead. Since it follows Halloween, some people might conclude that it is the same holiday, or an evil holiday praising death, but that couldn’t be father from the truth. 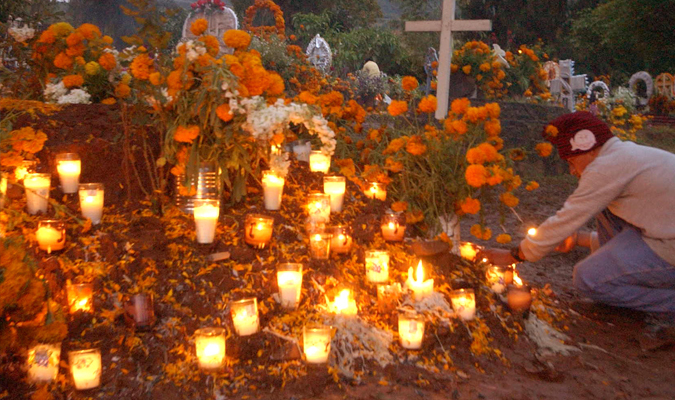 November 1st is traditionally referred to as Dia de los Angelitos (Day of the Little Angels) in Mexico and is the day to honor infants and children who have died followed by November 2nd, the actual Dia de los Muertos, when families tribute adults whom they have lost. It is believed that on these days, the souls of the deceased return to earth to be with their families and loved ones. The mood of these holidays will vary from grievance to humorous as relatives reminisce about funny events and anecdotes of their loved ones. One of Mexico’s most prominent symbols of Dia de los Muertos are the Catrina figures (little statues of skeletons dressed in formal clothing) which originated as a parody poking fun at an upper class Mexican female. Another tradition involves reciting short poems called calaveritas (little skulls), which are mockingly funny verses poking at the quirky habits or comical events of the deceased and their past. It is important to note that the celebrations for these holidays vary widely throughout the different regions of Mexico. In some areas, the cemetery plays a larger role in celebrations than in others where the home is the center of celebrations where altars and ofrendas are built. The favorite food and beverage of the deceased are often taken to graves and alters to honor the dead and in some regions, people celebrate the loss of children by hosting dinners consisting of specific foods and sweets. Costumes, body paint, and imagery of skulls and bones are often important in many areas of Mexico when celebrating these holidays as well. As November approaches, families stream in and out of local cemeteries to scrub tombstones, clear away weeds and lay out flowers and candles. In the weeks before the celebration, a special market is set up near the Plaza Civica where everyone shops for decorations among stalls of sugar skulls, miniature coffins, skeleton puppets and the familiar skeleton masks and figures, known as calacas. The city annually celebrates The Calaca Festival hosting various artistic and cultural events for children and adults. Read more about Day of the Dead in San Miguel Allende here. Oaxaca transforms during Dia de los Muertos as the city prepares to welcome their loved ones spirits back to earth. The week starts with “Plaza de los Muertos” commencement where the marketplaces start to sell everything related to Dia de los Muertos traditions: pan de muerto, calaveras, papel picado, cempasuchils, incense, and so forth. With this, families can buy what they need to create their colorful and vibrant altars in their homes. Arcs of bright cempasuchils provide a welcome to spirits who are crossing over. For visitors, Oaxaca has elaborate Day of the Dead altars set up throughout the town and sand tapestry competitions. While Mexico City holds several events to commemorate the traditions and icons of Dia de los Muertos, the greatest immersion can be found in Mixquic. In the center of this neighborhood is one of Mexico City’s oldest cathedrals and surrounding it is it’s cemetery. A incredible altar and intricate tapete sit at the end of the church adored with gold. Candlelight processions and mourning families join in the graveyard at their loved ones tombstone throughout the night. Outside the gate is a complete change of scenery; the neighborhood is a full fair with rides, carnival games, face painting, and entertainment including artistic performances and interpretations of the holiday. Most interestingly, there is a museum that shows a documentary of Dia de los Muertos in Mixquic and how traditions are being influenced by Halloween. Aguascalientes is the birthplace to Jose Guadalupe Posada, the artist who created the La Catrina symbol that is now very representative of Dia de los Muertos. 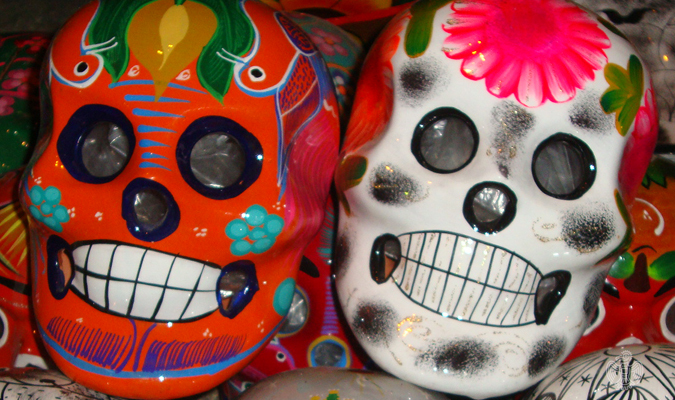 The city celebrates with a 10 day festival called Festival de las Calaveras. The festival is intended to rescue and preserve the traditions of Dia de los Muertos and pay tribute to Jose Posada. Artists fill the festival recreating some of Posada’s images and actors participate in thematic tours. Cinematic performances, music shows, a Skulls’ Parade, altar building contest, and pan de muerto contest are also important parts to the festival’s celebration. In the Magic Town of Patzcuaro, Michoacan there is a small island called Janitzio that many Purepecha indigenous people call home. This indigenous group, also known as Tarascans, have elaborate Dia de los Muertos rituals that include processions to the cemetery where they stay night until dawn singing and praying. It is tradition that the women and children create ofrendas (offerings) above their loved ones tomb while the men gather together to drink and admire from afar. When dark falls, candles illuminate the way to the cemetery, a ritual considered scared by the community. Riviera Maya hosts an annual Festival de la Vida y la Muerte (Festival of Life and Death) at Xcaret park in honor of the Dia de los Muertos. At this festival, visitors are encouraged to participate in music and dancing, shop for Day of the Dead trinkets, and try typical Yucatecan fares. Guests can watch parade performance and tour the cemetery to learn about the Mayan burial rituals. Hi! Dia de los Muertos is similar to a holiday I celebrate where I live. That holiday is Halloween. On Halloween people dress up, just like people do on Dia de los Muertos. For Halloween, there are also festivals as there is on Dia de los Muertos. Also, there’s parties, celebrations, and rituals on Halloween as Dia de los Muertos has too. Although Halloween is celebrated October 31st, it is very similar to Dia de los Muertos. Thanks for your comment, and about the similarities you mention, the celebrations are not so similar as you though. Dia de los Muertos in Mexico is an especial celebration where we honor and remember our ancestors that are not longer with us. The parades and painted faces are becoming more popular nowadays to show the world that we are celebrating one of our deeper traditions and that happens more often in bigger cities where many people come to enjoy this celebration, but the traditional celebration takes places on the commentaries bringing flowers, food and other elements and each home with the “altares”. We hope you can join us next year and witness this wonderful celebration on your own.